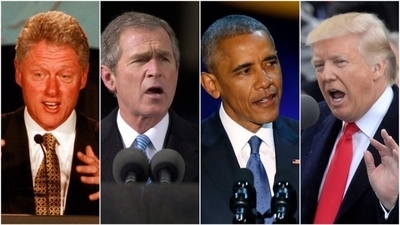 MEF has coexisted with four U.S. presidents. 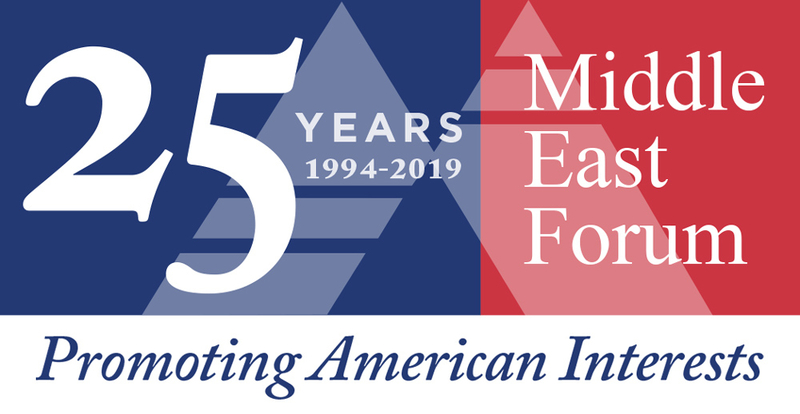 Today marks the 25th anniversary of the founding of the Middle East Forum. I'll take this opportunity candidly to review our ability to influence U.S. policy over the quarter century and assess where we stand today. Opening our doors in early 1994 with the Middle East Quarterly as our main activity, it was difficult to win attention or financial support for a new organization with the slogan "promoting American interests." Things seemed to be going so well for the United States – success in the Kuwait War, the Soviet collapse, and the Oslo Accords – convincing the Clinton administration that the Middle East remained a cauldron of dangers proved an uphill battle, a hill generally too steep for MEF to climb. Accordingly, we struggled in those early years. Opening MEForum.org in 2000, however, positioned us for the turbulence ahead. 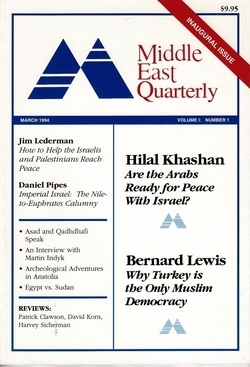 The inaugural, March 1994, issue of the Middle East Quarterly. 9/11 and the Iraq war woke Americans abruptly to Islamist and Middle Eastern threats, catapulting our topics to the center of American and world attention, giving us the opportunity to get out our message and secure more stable funding. During the George W. Bush years, despite this public success and many friends in high government positions, we could not claim to have an impact. Sadly, those friends dealt poorly with the Islamist challenge ("war on terror," anyone? ), the Iraq war, Turkey's Erdoğan, Palestinian-Israeli diplomacy, and democracy promotion. Indeed, MEF lost more friends during those years than it influenced policy. We consoled ourselves by launching four initiatives: Campus Watch (2002), Islamist Watch(2006), the Legal Project (2007), and the Middle East Forum Education Fund (2007) which now financially supports 80 allied individuals and organizations. During the Obama years, no one in government consulted us about such follies as ignoring Iran's Green Movement, abetting Mubarak's overthrow, toppling Qaddafi, underestimating ISIS, back-tracking from the Syrian red-line, or signing the Iran deal. We did, however, use these bleak years to set up a beachhead in the imperial capital with the Washington Project (2009), build a presence on Facebook and Twitter (2009), lead the first of five international trips (2012), and establish both the Ginsburg/Ingerman Writing Fellows program (2014) and the Young Adult Division (2016). Despite severe reservations about Donald Trump, MEF has had its best-ever access to and influence on his administration. Our voice is heard regarding such issues as Muslim immigration, the Islamist threat, cutting funds to the Palestinians, relations with Qatar, and exiting the Iran deal. 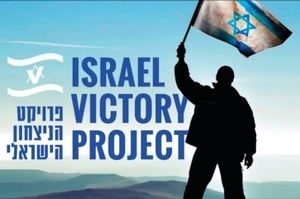 The Israel Victory Project (2017) with a staff of six in Washington and Jerusalem, works for a paradigm shift away from appeasing Palestinians in favor of their defeat. The Counter Islamist Grid(2018) consists of a network of researchers/writers/activists across the United States. Friends of MEF plan soon to set up a 501(c)4 that, independently of our organization, will influence Congress on issues of mutual concern. Additionally, the MEF Legacy Society offers a way for donors to leave bequests to the Forum, while the 100th issue of the Middle East Quarterly appeared recently. Two conclusions: First, our history confirms the adage that "Success is the ability to move from one failure to another without loss of enthusiasm." Second, I pessimistically expect the Middle East in 25 years to remain a great source of problems but optimistically foresee the Forum ever-more effectively promoting American interests.